This story originally appeared in the Society of Environmental Journalists SE Journal Online. Follow SEJ on Twitter @sejorg. Those of us who teach often tell students that learning journalism is useful for many professions. The same might be said of teaching journalism. "But fostering in non-journalists reporting skills and values like accuracy, fairness, transparency and engagement advances the function of journalism." Like other journalism instructors, I increasingly teach the skills and values of our profession to non-journalists. Much of that demand comes from scientists and researchers under the gun to more directly communicate the knowledge they create. New doctoral students acknowledge the need to publish in academic journals. But they also want to reach more than just journal readers. They want their science to inform the public and policymakers. The motive can simply be to bolster their shot at getting grants. Funders want research with impact. Communicating it is one way of making sure that it does. The lesson here: Teaching journalism is as useful of a skill as journalism itself. It offers opportunity outside of our normal sphere. For me, opportunity meant teaching scientists and journalists in Malawi, Rwanda and Peru for almost a month this past summer. Here’s how that fell into place: In addition to my work at the Knight Center for Environmental Journalism at Michigan State University, I’m on a USAID project at MSU that fosters food systems innovation. I have the overly grand and certainly non-journalistic title of director of translational scholars for the Global Center for Food Systems Innovation. It’s a gig I was asked to pick up because of some other communications work I had done with campus researchers. Part of that job involves guiding journalism and other students to report on food system challenges and solutions. We report on a multimedia platform called The Food Fix. Another part involves teaching faculty and student researchers affiliated with the center to do a better job of explaining what they do. Almost two years ago, I was involved in the MSU innovation center’s initiative to stimulate creative research at Malawi’s Lilongwe University of Agriculture and Natural Resources, or LUANAR. 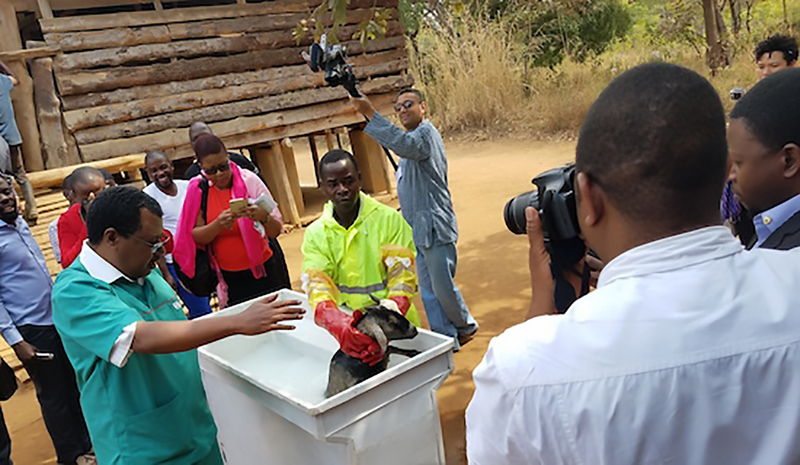 When I first traveled to Lilongwe, I met people working on another USAID project doing what I more typically do – training journalists to better report on agriculture. We decided to merge efforts. I became part of a team that worked with the LUANAR innovation scholars, building within them the desire and the capacity to communicate their research. 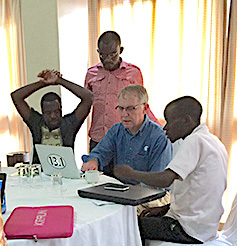 But I also met with Malawi journalists, helping them make sense — and journalism — out of the research we exposed them to. We worked separately with both groups before following an abbreviated script of a typical Society of Environmental Journalism conference. We brought the journalists to LUANAR to meet with the researchers, who by then were practiced in explaining their work. The reporters took mini-tours of research facilities. And we hosted a panel of journalists and university officials to discuss the challenges of communicating research to the public. Then, we brainstormed story ideas and approaches with the journalists and provided feedback and edits. Both groups benefited. So did the public. The journalists produced stories that would not have otherwise been reported. We even ran some on our Food Fix news service. From Malawi, I went to Kilgali, Rwanda, and then on to Lima, Peru, to teach at two workshops for the International Potato Center. I worked with that center’s economists, geneticists and ecologists after Hugo Campos, the group’s director of research, visited the MSU campus last spring. His researchers have great stories to tell — the center won the 2016 World Food Prize, an international award recognizing people who advance human development by improving the quality and quantity of food. Campos is convinced that his scientists and researchers need to tell those stories to attract support. I was incredibly lucky this summer to meet great people with great stories, and to travel through some fascinating countries. It’s fulfilling work, hopefully with lasting impact. I still do an occasional free edit for the journalists I met. And researchers have sent me articles, presentations and even poetry they’ve created subsequent to those workshops. It’s creative stuff that communicates. I’m leading some regional research communications workshops yet this fall. I’m unsure if I’ll ever again have the opportunities I had this summer. Write. The need for good writing of grant applications and reports is significant. Focus your skills toward helping others get grants. Network. My path to international development involved extensive source-building. I didn’t realize I was doing that because it is second nature to journalists. Learn. Attend a few of the excellent science communication training programs out there and borrow their methods. They’re generous. Just give them credit. Read a few books. Say yes. I almost didn’t meet with Campos because I thought I had little in common with a potato geneticist. But we talked about narrative structures. And the next thing I knew, I had an invitation to Rwanda and Peru. Take chances. I’ve led workshops where scientists wrote poetry, performed improv, pretended to be reporters, explained their dearest research project in less than a minute. It’s fun. It works. Such work is not independent journalism. And that is our core constituency. We shouldn’t stray far from that. The world needs journalism and lots of it. But fostering in non-journalists reporting skills and values like accuracy, fairness, transparency and engagement advances the function of journalism. It’s a valid use of our expertise. Journalism is hard. Teaching it is yet another kind of hard. If you can do both, you’ve got mad skills that are in demand. David Poulson is the senior associate director of Michigan State University’s Knight Center for Environmental Journalism. He teaches environmental, investigative, computer-assisted and public affairs reporting. Prior to arriving at MSU in 2003, he was a reporter and editor for 22 years, most of it covering the environment.